Hi folks, hope your week is going well! Todays little card is for a first anniversay! This time last year, we attended a wedding in Majorca. This little card is for the happy couple! Happy 1st Anniverary Ana & Roy! Not a lot I can say about it really! A simple little card but I'm happy with how it turned out. I used an A6 linen embossed card base. doily punch & added a sentiment which I created on my PC. 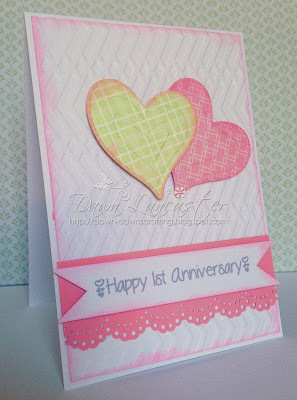 I've used a free font called"Vanessa Loves You"
A pretty anniversary card Dawn, lovely pastel colours. Lovely anniversary card, I'm sure the couple will be touched by your remembrance! Beautiful anniversary card! I love the design. Lovely card!! Thanks for joining us at Make My Monday! A gorgeous anniversary card Dawn. Very pretty card, thanks for sharin with us at HIMCR!! lovely! Thank you for taking part in crafters cafe blog challenge #120. Love this fun Summer colors card! !